What should I expect when my cat/s stay at the Purring Parrot? 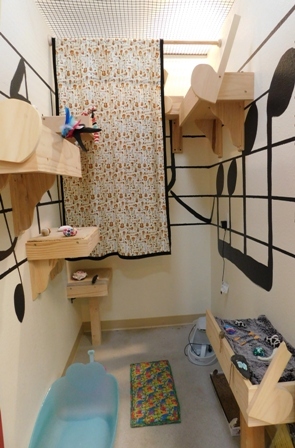 Our Rooms: Every cat family has their own standard size 4ft x 6 ft x 8ft high walk-in suite. We do not offer communal lodging or play areas to ensure private and clean accommodations. Our suites are designed so that we may go in, sit down and spend time with kitty. All suites are large enough for 2 cats with the exception of our larger suites, for cat families with more than two cats or cats that need extra space. All suites can be expanded, with a creative kitty walk through, for the larger cat families. Our suites are set up so kitty will not see the other cats that are staying with us, which helps alleviate stress. The Décor and some included amenities: Each suite has its own unique theme and designer furnishings for kitty to use. Amenities included in kitty’s stay are designer litter boxes, mats, food bowls, “Drinkwell” pet fountains, cat lounging trees, kitty beds, simple toys, cat nip/grass for nibbles, housekeeping twice daily, and a kitty turndown service. Each room also has a "mouse on a string" butler, which kitty can treat as kitty pleases. Extra Amenities: We also have a menu of extra goodies if kitty so desires, such as cooked chicken, salmon or tuna, and tissue paper tear ups just to name a few. Prices can be found on our fee list. Do we offer play time and does it cost extra? Yes, we do. No, it does not cost extra. Time will be spent with kitty in their suite for play, brushing, massages, or whatever kitty likes. Housekeeping is done twice daily which allows for attention time and we also include one on one play sessions. For entertainment: Not only do we have playtimes but some suites face our Aviaries or have windows that look outside. Kitty can look out to see what feathered friends we have staying with us. Parrots can be very fun to watch. The glass in the Aviary is double-paned windows and far enough away so the birds don’t notice kitty watching them. We also have kitty webcams for owners to check on their kitties 24/7. We have relaxing music or sounds being played. For the kitty that wants extra bird watching time SodaPop, Bean or Jupiter will be happy to help them out with that request by going from door to door for up close bird watching. Food and Water: We serve filtered reverse-osmosis water and a variety of cat foods both wet and dry, such as Friskies, Fancy Feast, Iams and Purina. If your kitty is on a food different then what we have then we recommend you bring it so kitty doesn't have to have a diet change. If it is a prescription or raw diet, and since we are not a vet clinic, then you will have to bring it in. Do we charge extra if you bring kitty’s own food? No, but there will not be any discount given if food is brought from home. Items from home: If your cat is easily stressed, sometimes having the scents of their own home near them will help ease staying away from home. Please feel free to bring items from home such as a blanket or clothing that may have your scent on it. We can keep the items in an air tight bag and change them out daily so kitty can enjoy the scent and familiarity. Medications: If kitty is on any medications or needs fluids then please bring everything with you so they can be administered. Charges for this can be found in the fee list. We will also accommodate senior or handicap kitties by making sure everything is comfortable and easy to reach. Shy kitty: We understand the shy kitty and they will have plenty of places to hide, high and low, for private peering down or out. We will still go in and at least spend time with kitty because that might help them relax a little more. They can also come out at their own pace and when they are ready to make friends we will be there. Sometimes a plug-in of Feliway, a cat pheromone, can help too. Sneezing Kitty: Sometimes when cats leave home they get stressed causing their immune system to weaken and they may start sneezing or get watery eyes. If this happens we can add Lysine to their food, which is an amino acid and can help the immune system. Emergencies: If kitty has an emergency we will contact you ASAP as well as get them to their vet, if available and if not, to the nearest emergency clinic. We require that a credit card is kept on file with us so we are able to quickly get the medical attention your kitty may need. Transport charges are listed on our fee list. Email updates: We will be happy to send you email updates on your kitty at no charge. For a little extra we can also send you photo updates. We also have kitty webcams so cat parents can look in 24/7, plus they ar equipped with nightvision and pan/tilt ability. We also have a daily diary for kitty so you will know how things went each day. Arriving and Departing: All cats must arrive in a carrier and leave in a carrier to prevent escape, conflicts with other cats or anything else that could happen. Vaccinations: Vaccine protocols have changed greatly in the past years with the advancement of research. The recommended vaccine protocol used to be yearly for FVRCP but has now changed to an every 3 year protocol or possibly even getting a vaccine titer to see what the levels of immunity are. We understand that some cats are unable to be vaccinated because of vaccine reactions, sarcomas or the preference of the owner not to vaccinate because their cat never is around other cats or is indoor only but the FVRCP is highly recommended. We can only highly recommend what would be ideal, which would be a 3 year FVRCP. This vaccine is like getting a kitty flu shot and helps protect your cat against airborne viruses, which can be picked up whenever exposed to the outside world, such as going to the vet, boarding away from home, or even sitting by an open screened window where another cat could easily pass by and sneeze. If your cat goes outdoors to unsecured areas, then it is recommended they have all 3 vaccines, FVRCP, FeLV, and Rabies. This a controversial topic and our stance on it is that your veterinarian is the expert. *** If you do vaccinate it must be done 2 weeks prior to staying with us in case there are any side effects. We also recommend an annual exam for your kitty to make sure that they are healthy when staying with us. Required with no exceptions: Flea control and either spayed or neutered if over 4 months of age. Fleas: Upon arrival kitty will be flea combed to make sure they are flea free. If fleas or flea dirt is found then we will apply either Advantage, Frontline or Capstar for a fee. Either way it is always recommended that a flea product is applied before coming to see us so kitty arrives with no “extra friends” and goes home the same way. Spay/Neuter: All kitties over 4 months of age must be spayed or neutered. Hormonal kitties tend to be territorial and can have the tendency to spray their areas which may smell good to them but not to us. If your kitty does have a spraying problem we will be unable to accommodate them and recommend a visit to the vet and possibly an animal behaviorist to curb the problem. We want to give you and your cat our undivided attention to fill out kitty’s profile of likes, dislikes, preferences, medications, etc. Plus we will need information on yourself too. We will then show you to kitty’s suite so you can help them settle in. Visiting before you need us: It is always recommended that you come and look at a potential place where kitty might be staying. We welcome and encourage this. If you like what you see then we can go ahead and get your paper work ready ahead of time. This way when you arrive to we can just take you directly to your room to settle kitty in. This can really help things out on the day of your departure and you will need to do less rushing around.